The Briard, also known as the Berger de Brie, is a very old breed, dating all the way back to the 14th century where it appeared in the novel “Livre de chasse”(Book of the Hunt). Briards have been owned by historical figures such as Charlemagne, Napoleon, Thomas Jefferson and Lafayette. The Briard is primarily a flock guard and herding dog, which is what it's main purpose was up until World War I. The Briard's use in World War I brought the breed nearly to extinction. They were utilized for many tasks such as running messages, delivering food and ammunition to the front lines, locating wounded soldiers, detecting mines and picking up trails. The Briard developed popularity in 1863 after the Paris dog show. The Briard became fully recognized by the American Kennel Club in 1928. This breed is still utilized as a flock guard, however, it has also taken on work with the military, police and search and rescue. The Briard may be an excellent working dog, but they are still considered wonderful family companions. The Briard male will reach heights of 24-27 inches, while the female will reach a slight smaller height of 22-25 inches. The males can weigh anywhere between 75-100 pounds and the females will weigh between 50-65 pounds. The Briard has a double coat, which is a very rough and wiry outer coat and a fine close lying undercoat. The coarse outer coat has been compared to the coat of a goat. The coat is water and dirt resistant and will shed very little as long as it is properly groomed. 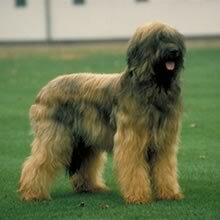 The Briard's coat can come in many color variations with the exception of white. The most common coat colors are black, gray and tawny. The gray and tawny coats may come in various shades and have been known to fade and darken with age. The Briard is a very brave, intelligent and loyal breed. They will become very attached to their family very quickly and will often become quite protective of them. The Briard requires a good deal of attention from their owners, but will prefer play time before affection. The Briard was bred to accomplish their tasks on their own, and so this breed tends to be quite stubborn. It is necessary to be a very firm and consistent pack leader with this dog. The Briard will begin to take control if they believe the pack leader is faltering in their leadership. The Briard is a very brave, intelligent and loyal breed. They will become very attached to their family very quickly and will often become quite protective of them. The Briard requires a good deal of attention from their owners, but will prefer play time before affection. The Briard was bred to accomplish their tasks on their own, and so this breed tends to be quite stubborn. It is necessary to be a very firm and consistent pack leader with this dog. The Briard will begin to take control if they believe the pack leader is faltering in their leadership. The Briard is quite loving and affectionate with its family. They are typically very suspicious of strangers and will need to be introduced to anyone new on their terms. The Briard is known to do very well with children of any age as long as they are raised together. However, the Briard does not appreciate teasing. It is imperative that the Briard begin receiving regular socialization from a young age to assist in friendliness towards outsiders as well as towards other animals. They can display dog aggressive tendencies if not properly socialized. Even a Briard that has never seen a farm will have a modicum of herding ability and may attempt to herd humans by nipping at their heels. This behavior should be discouraged at a young age. You can find Briard puppies priced from $1800 USD to $2000 USD with one of our credible breeders. Browse through our breeder's listings and find your perfect puppy at the perfect price. The Briard is quite loving and affectionate with its family. They are typically very suspicious of strangers and will need to be introduced to anyone new on their terms. The Briard is known to do very well with children of any age as long as they are raised together. However, the Briard does not appreciate teasing. It is imperative that the Briard begin receiving regular socialization from a young age to assist in friendliness towards outsiders as well as towards other animals. They can display dog aggressive tendencies if not properly socialized. Even a Briard that has never seen a farm will have a modicum of herding ability and may attempt to herd humans by nipping at their heels. This behavior should be discouraged at a young age. The Briard's coarse coat requires regular weekly brushing to prevent matting. They will shed quite little as long as they are properly groomed. It is also necessary to remove any excess hair from the pads of the feet and ears. The Briard will adapt to life in an apartment, as they are not overly active indoors, however, they will do best with a good sized yard to play in. The Briard is quite intelligent and eager to please. This breed will be relatively easy to train, as they were intended to complete tasks without supervision or even direction. The Briard does require a firm hand when training, however, they will not respond well to anger and could become timid if frequently communicated to in anger. The Briard is by nature a working dog and will do best with a job to do. If left without ample exercise, the Briard will become restless and engage in destructive behavior. The Briard requires a long daily walk or even a jog, as they are deemed to be fantastic jogging partners. Briard Puppies for Sale - Shipped Worldwide! Finding the right Briard puppy can be dog gone hard work. PuppyFind® provides a convenient and efficient means of selecting and purchasing the perfect Briard puppy (or Briard puppies) from the comfort of your home, 24 hours a day, 7 days a week. Take advantage of our PuppySearch or leisurely browse our directory of hundreds of dog breeds, Briard dog breeders, Briard dogs for adoption, and Briard puppy for sale listings with photos and detailed descriptions. Some Briard puppies for sale may be shipped Worldwide and include crate and veterinarian checkup. Many Briard dog breeders with puppies for sale also offer a health guarantee. With thousands of Briard puppies for sale and hundreds of Briard dog breeders, you're sure to find the perfect Briard puppy.